Alyssa Grace Magsano is a yoga instructor, dancer, writer, and traveler living in New York City. She has trained at The National Ballet School of Canada and Tisch School of the Arts at New York University, where she earned a Bachelor’s Degree in Media, Culture, and Communications with a minor in Creative Writing. She is a 200 RYT certified teacher through Yoga to the People and currently teaches at Sweat Yoga and hOM in New York City. Alyssa spends her days practicing yoga, writing, and drinking way too much coffee, as well as finding ways to give back to the community through her developed understanding of yoga instruction. With an eye for adventure and a heart full of gratitude, she chooses to stay passionately curious and is eager to explore all corners of our rare and beautiful world. After her adventures, she settles at her home in Brooklyn, New York. Glimmering waters, secluded beaches, exquisite dining and pristine white-stone architecture comprise Croatia’s Dalmatian Coast. Journey to the heart of Dalmatia for an experience rich with history and culture, while taking in Nature’s brilliance and deepening your yoga practice. We begin our retreat in the bustling coastal town of Split, where old world charm meets modern luxury. Our first two nights are spent inside Diocletian’s Palace, an UNESCO World Heritage Site and one of the most complete and well-preserved palaces of the Roman Empire, built in 305 AD. From Split, we continue to the nearby island of Brac where white pebbled beaches, picturesque vineyards, quaint stone villages and fresh Mediterranean cuisine await. Our private villa is located in a rustic hillside village that offers both tranquility and proximity to breathtaking beaches. 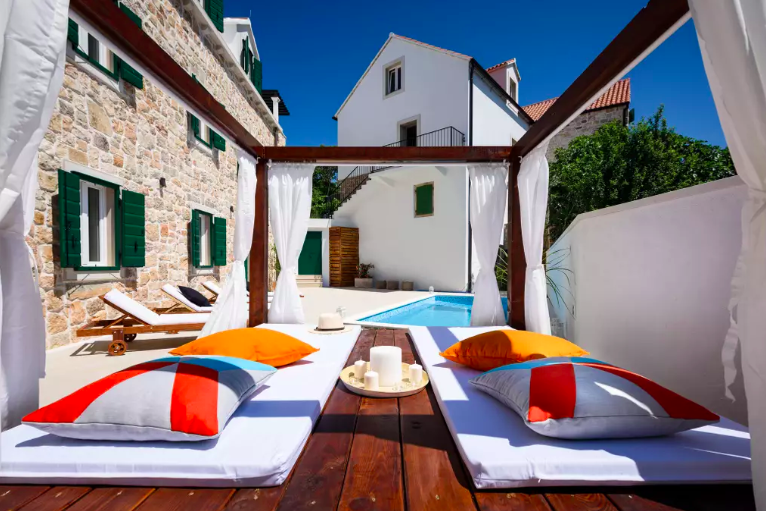 Explore the wonders of the Adriatic Sea, connect with self and others through daily yoga and meditation, and luxuriate in your personal retreat on this week-long gift to self. 1. What airport do I fly into? You will fly into the Split Airport (SPU) which is located about a 30 minute drive from our hotel in Diocletian’s Palace. When you arrive, you can take a taxi or airport shuttle bus to Diocletian’s Palace. A one-way taxi ride will cost about $40.00 US Dollars (250 Kuna) and a one-way shuttle bus trip will cost $5.00 US Dollars (30 Kuna). Transportation details will be provided once you have registered, private transportation can be arranged for an additional cost (same as cost of taxi). Katya will greet you at Diocletian’s Palace and walk you to our hotel. 2. Do I need a visa to visit Croatia? No, you do not need a visa to visit Croatia. But please remember your Passport! 3. What are expenses like in Croatia? Croatia is very affordable and offers a variety of dining and shopping options. Delicious and filling dinners can start around $10 US Dollars in some restaurants. 4. Will there be free time? Yes! Each day there will be designated free time to honor your personal retreat. You may wish to go for a dip in the pool, stroll along the beach, explore local cafes and shops, or spend time relaxing in solitude. 5. What are the accommodations like? Both the hotel in Diocletian’s Palace and the private Villa on Brac Island are rated as 4 star properties. Our first two nights are spent in a charming Bed and Breakfast within white stone Palace walls, where piazzas and pedestrian-only marble-paved streets are lined with cafes, boutique shops and restaurants. We spend five nights at our private hillside villa on Brac island. The villa, built from traditional Dalmatian stone, offers historical charm and contemporary comfort. It is beautifully furnished, has a lovely pool, and rests in the heart of a peaceful village. 6. If I am traveling alone can I still share a room with someone? Yes. If you are traveling on your own and would prefer to share a room, we will do our best to match you with a roommate of the same gender. If we are unable to match you with a roommate, a single supplement will apply.